For better or worse, we’ve been spoiled. In today’s information-ready world, when we need an answer, we expect to get it fast—almost instantly, in fact. Anything else falls short. The real estate industry is no exception. One of the biggest challenges for today’s real estate professionals is responding to leads with lightning speed. Yet, as busy agents doing the important work of relationship-building, dropping everything to respond to a lead is often not possible. So how do agents build new business when they’re knee-deep in current business? By bringing in the right reinforcements. Rock Connections, a sister company of Quicken Loans, is designed for this exact purpose. The Detroit-based sales and marketing company specializes in providing inbound and outbound contact center services for several industries, including real estate. Rock Connections launched in 2012 with 22 team members, created out of a need to support Quicken Loans’ rapidly growing mortgage business. Fast forward to 2017, and Rock Connections is now 800 people strong. This point is particularly salient to real estate professionals whose entire business is built upon local expertise. 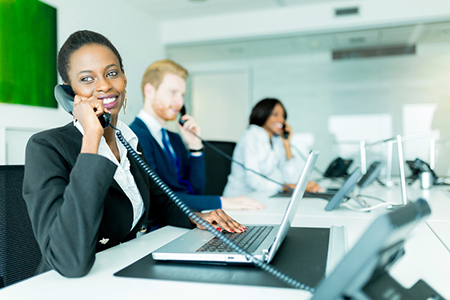 Working with a contact center to handle leads more efficiently is an idea that’s quickly gaining traction in the real estate community, with more and more brokers outsourcing the service or, in some cases, creating their own in-house operation. Raab believes that what Rock Connections offers, however, is a better alternative for three primary reasons. “First, we are very much aligned as an organization from the top down, with a culture that empowers all team members to be actively involved. Our culture is our secret sauce,” says Raab. The combination of culture, technology and manpower all add up to deliver the Holy Grail of lead management: response time. This focus on connecting with leads gives Rock Connections’ specialists a chance to have real conversations that allow them to drill down into a client’s needs. “What neighborhoods are you interested in? How many bedrooms and bathrooms? What square footage? We can get the information the agent needs to help them have better interaction with the clients,” says Raab. Rock Connections’ approach to leads, therefore, allows the agent to not only benefit by getting to new leads as fast as possible, but by revisiting older or “aged” leads, as well. Raab defines an aged lead as one that falls outside of the 30 – 90-day window, or one that’s been sitting in a CRM receiving drip emails, but has never physically been contacted. According to a Rock Connections’ aged lead pilot, specialists made contact with approximately 40 percent of aged leads, 9.4 percent of which resulted in a live transfer to an agent. Most eye-opening, however, was that a whopping 39 percent of the people Rock Connections spoke with had already purchased a home. At the broker level, Rock Connections offers several benefits, including increased business, better agent retention, and perhaps most importantly, control over an otherwise disjointed process. “Some brokers invest their own dollars in providing leads and handing them out to agents,” says Raab. “Part of the problem is they don’t know what happens to them after that. Our services provide the broker with visibility into what is happening with their leads, such as contact rates and who leads are being assigned to. Whatever business rules the broker would like to put in place, we customize the experience for them,” says Raab. With this insight, brokers are better able to assign leads and ensure a consistent experience when leads are contacted. Rock Connections works with the broker’s CRM to deliver detailed reports on what’s happening with leads, giving them peace of mind that the dollars they’ve invested in lead gen are going to good use. At the end of the day, real estate agents are not contact center representatives, and trying to replicate that skill will only take them away from where their real value lies: working with clients looking to buy or sell a home. To find out more on how Rock Connections can help your business, please contact the Quicken Loans Agent Relations team at AgentRelations@QuickenLoans.com or (866) 718-9842. For more information, please visit agent.quickenloans.com.